After passing through Olveiroa and leaving behind the guesthouse-restaurant As Pías walkers begin the journey on the asphalt road that abandons the village. Almost 50 meters before joining the main road, the route deviates to the left, close to a washing area, and heads in the direction of the reservoir of Castrelo. The views over the river Xallas and of the surrounding forest are the first rewards of the day. At some points and due to a lack of signposts, pilgrims may have difficulties to follow the route. They should not be too concerned about this as without deviating from the route, a little over 2 kilometres away, and now on descent, they will reach the stone bridge that crosses the river of Hospital and the enclave known as Vao de Ripas. From here on, the route continues upwards and arrives in Logoso, where, an albergue with a bar receives pilgrims. Here they serve breakfast from 06:00 hours and offer menus priced at 9 euros. Furthermore, 200 meters from the pilgrim route, the restaurant A Pedra is situated, serving breakfast and a menu of the day at the same price. The location of Hospital is reached. The crossroads to Finisterre or Muxía At the exit of Hospital the route connects to the DP-3404 road. Leaving, on the left, the bar O Casteliño, the last catering establishment until Cee, situated 14 kilometres away. There is a dangerous junction beforehand. On this section there are no major slopes and the journey is converted into an easy stroll. 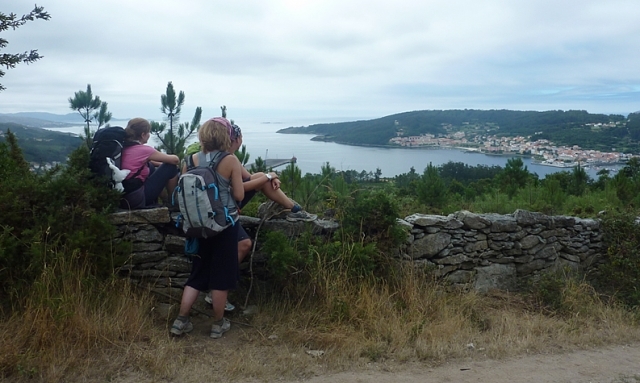 The first view of the estuary and of the cape of Finisterre From this moment on the walkers continue for more than two kilometres on a path of good firm ground, with slight oscillations, until reaching the Sanctuary das Neves. At the other side of the Camino there is an area with outdoor tables, without shade, known as Fuente Santa. The itinerary continues, on ascent on an endless slope, on one of the most solitary stretches of the day. The route enters the mountains of Pedras Loiras and A Cheda until reaching Campo de San Pedro. A steep descent until reaching Cee After this short and rehabilitating break the pilgrims continue the Camino and, after 2.5 kilometres, they arrive at a turn off with a sign that informs walkers that 100 meters to the right the famous Cruceiro da Armada is situated. It is worth taking the detour and from this point travellers will have, for the first time, the presence of the beautiful coastline of the Costa da Morte (The dead coast), along which, abrupt rock formations alternate with enviable sandy stretches. From this place the pilgrims can now glimpse, in addition, the goal of the stage, the legendary Cape of Finisterre. Hikers then arrive in Cee, the most populated location on the Costa da Morte and the one with the most services. Pilgrims can divide the stage in two and rest in this town, with numerous albergues and a dynamic daily life, even more so during the summer months. The neighbouring location of Corcubión is now reached, one of the most charming locations in the area. In fact, its historic centre has been declared historic-artistic interest. A journey along the coast The entrance to Corcubión is via the pavement that borders the coast, a path on which the first accommodation establishments are advertised. Along the coast walkers arrive at the milestone in the square of Castelao, which, informs pilgrims that a little over 13 kilometres remain to reach the cape of Finisterre. After a steep slope and crossing the AC-552 via a dangerous crossroads, without a pedestrian crossing, the location of Campo San Roque is reached and, the albergue for pilgrims managed by the Galician Association of Friends of the Camino of Santiago. From here walkers pass Amarela, Estorde with is campsite and, pilgrims are presented with a sign by the council of Finisterre. Before arriving they will pass through Sardiñeiro, with numerous accommodation establishments and restaurants, where, at the entrance to the location, pilgrims may have difficulty in knowing which route to take due to unclear signposts. After the municipal sign the route takes a turn off to the right. On continuing pilgrims will have to look out for a turn off which should be taken to the left, in front of a row of houses (the arrow is on the wall). From here walkers reach the long beach of Langosteira. A resting place for pilgrims, to bathe in its waters has practically become a ritual for walkers arriving in Finisterre. On the descent, pilgrims will find the location of Calcoba, with numerous services for tourists, such as, the hotel Alén do Mar and the restaurants Praia da Serra and Calcoba. A little later Finisterre is reached with its famous restaurant Tira do Cordel. On the calle Real hikers will find the municipal albergue and the tourist office. In this building the brave walkers of the Camino of Finisterre can receive the document issued by the council to accredit having covered the journey from Santiago. The last climb to the lighthouse There remains just one last stretch to the stage, the most symbolic. Having climbed the main narrow streets of this location, a place of hardy fishermen and sailors, three kilometres remain to reach the Cape of Finisterre, past the church of Santa María das Areas. Después de un largo camino como el Mozárabe por ejemplo, llegar aquí es el auténtico descanso del guerrero. 1 reviews Distance to Santiago: 74 km. 1 reviews Distance to Santiago: 98 km. 1 reviews Distance to Santiago: 79 km.